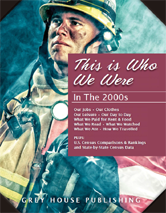 The This is Who We Were series provides the reader with a deeper understanding of day to day life in America during a particular decade. This new series is sure to be of value as both a serious research tool for students of American history as well as an intriguing climb up America's family tree. The richlyillustrated text provides an interesting way to study a unique time in American history. This section contains 27 profiles of individuals and families living and working in the 2000s. It examines their lives at home, at work, and in their communities. Based upon historic materials, personal interviews, and diaries, the profiles give a sense of what it was like to live in the years 2000 to 2009. This section includes lists of important “firsts” in America, from technical advances and political events to new products, books, and movies. Combining American history with fun facts, these snapshots present an easy-to-read overview of the 2000s. This section looks at a wide range of economic data, including prices for food, clothing transportation, and housing, plus reprints of actual advertisements for products and services of the time. It includes comparable figures for expenditures, income, and prices, plus a valuable year-by-year listing of the value of a dollar. This section offers reprints of newspaper and magazine articles, speeches, and other items designed to help readers focus on what was on the minds of Americans in the 2000s. These 50 original pieces show how popular opinion was formed, and how American life was affected. Cost of Past Wars in 2002 Dollars. From the Blog of Major P. Alston Middleton, Jr., USMC. This section includes state-by-state comparative tables, Census 2010 profiles and briefs. Households Lacking Complete Plumbing Facilities. Note: When reviewing the ranking columns, be aware that the District of Columbia is included in the list of states.